At HIMSS 13, I attended a session, A Dialogue on HIPAA/HITECH Compliance: Considerations Now That the HITECH Rules Are Here, that revealed insights into real-world applications of the new privacy and security rules, including the practical implications of the final breach notification rule for HIPAA hosting providers, other business associates (BAs) and covered entities (CEs) alike. The session was presented by Leon Rodridguez, the Director of Office for Civil Rights from the Depart. of Health and Human Services (HHS), the governing body of HIPAA (Health Insurance Portability and Accountability Act) that sets regulatory standards on the healthcare industry to ensure patient data security and privacy. James Wieland, Principal of Ober Kaler Grimes & Shriver Attorneys at Law also presented. One of the biggest changes that affects HIPAA compliant software and SaaS (software as a service) companies is that their hosting providers are now considered business associates under HIPAA. That means colocation and cloud hosting services that house PHI (protected health information) now fall under the purview of HIPAA and are subject to civil & criminal penalties of up to $1.5M. These penalties and fines apply whether or not the hosting provider knowingly has PHI on their servers or in their data center. The final ruling also makes it clear that healthcare & HIPAA compliant service and software companies must sign a BAA (business associate agreement) with their hosting providers and that the HIPAA compliant service & software companies have ultimate accountability for their hosting provider meeting or not meeting HIPAA requirements. Before the final ruling, some cloud providers claimed that they were simply “conduits” – only housing, but never accessing PHI on their servers. With the final ruling, HHS made it clear that conduits are considered BAs, subject to HIPAA compliance if they have “persistence of custody” of PHI. In other words, if PHI data is stored in a data center, or on a cloud server, then the hosting provider is considered a business associate and must be able to demonstrate that they can meet the HIPAA administrative, physical and technical requirements to assure the confidentiality, integrity and availability of electronic PHI. Leon Rodriguez, Director of HHS’s for Office for Civil Rights made it clear – cloud and colocation providers are BA’s and are subject to criminal & civil penalties if they are not compliant with the law. What does this mean to CE’s and BA’s that host their PHI at a colocation data center or with a cloud hosting provider? They must sign a BAA with their hosting provider. They must assure that their hosting provider is HIPAA compliant. They must assure that their hosting provider has signed BAAs with their subcontractors. They continue to hold ultimate accountability under the law if their hosting provider is found to not be compliant – and subject to fines that can reach $1.5M per violation. The final ruling is effective starting March 26, 2013 and enforcement starts on September 23rd. Any BAA signed with a provider prior to Jan. 25, 2012 with a hosting provider is grandfathered in and can stand through Sept. 23, 2014. If you sign a BAA with your hosting or colocation provider after Jan 25th, 2013, your BAA must meet all of the new requirements of the Final Ruling. Will you sign a BAA? Can I get a copy of your BAA for review? Does your BAA meet the requirements of the HHS final ruling? Have you signed BAAs with all of your subcontractors? Have your been audited against HIPAA administrative, physical and technical requirements for security? Did your audit follow the Office of Civil Rights Audit Protocol? Can I have a copy of your HIPAA audit report? For more on secure hosting for HIPAA compliant solutions, read our HIPAA Compliant Hosting white paper. Questions to ask your HIPAA hosting provider, data center standards cheat sheet and a diagram of the technical, physical and administrative security components of a HIPAA hosting solution (including HIPAA compliant clouds) are included. 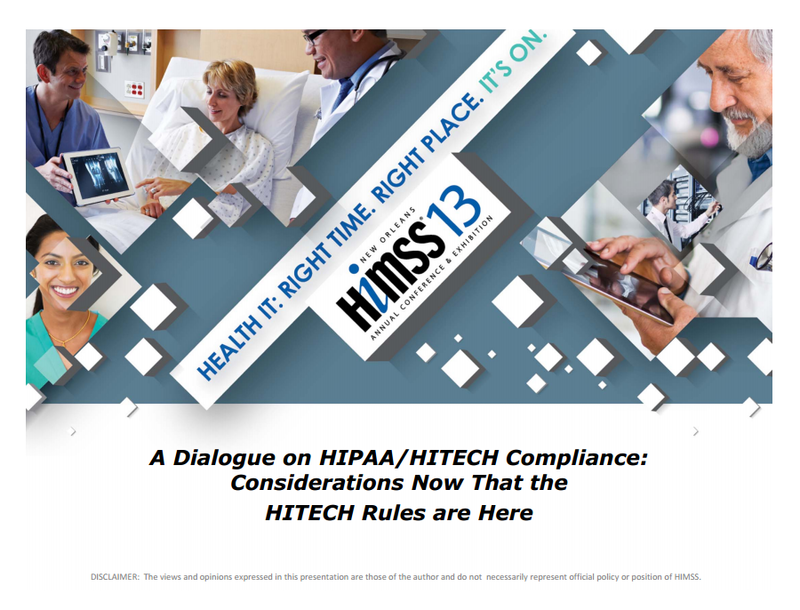 The post HIMSS 13: HHS Final Ruling Changes the Rules & Roles for HIPAA Hosting appeared first on Managed Data Center News.